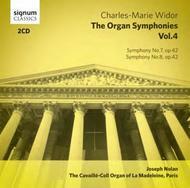 The fourth volume in Signum's Charles-Marie Widor Organ Symphonies, performed by Joseph Nolan on the magnificent Cavaill�-Coll organ of L��glise de la Madeleine, Paris. Bridging the generations from Mendelssohn to Messiaen, Empire to Republic, Widor was born to the organ. His Lyonnaise kinsfolk were organ-builders, he showed early talent for the instrument and for decades was the embodiment of its might and splendour across the Gallic domain. His �Organ Symphonies� have been genre-defining in their influence. Joseph Nolan is an internationally renowned organist, acclaimed as "brilliant and such an astute musician" (Gramophone). He was appointed to Her Majesty�s Chapels Royal, St James�s Palace in 2004, and has since been invited to perform and record in some of the world�s premiere venues � including the refurbished Organ of Buckingham Palace Ballroom (SIGCD114) and the Organ of Saint-Sulpice in Paris (SIGCD167).